It takes a bit of motivation (but not a lot) to do some yoga from YouTube in the morning. These might just trick you into being in a good mood, but they seem to work for me. Everyday I do one or two yoga videos. I pick out my clothes at night usually but if it has to be done in the morning I like to keep it simple. 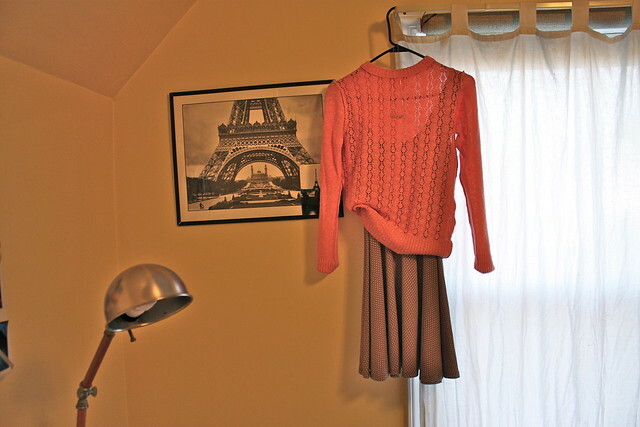 During the winter its really difficult because I've got to think in layers, but now its a breeze to pick a dress out of my closet and pair it with a light sweater. Showering at night gives me a lot more time in the morning, and then I let my hair air dry at night then fix it with the blowdryer in the morning. After that I put on my makeup and then I'm off to the train! Aw this is such a cute post. 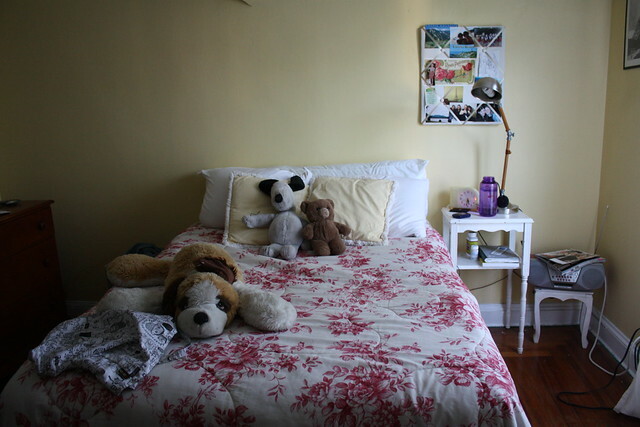 I love seeing what other bloggers' rooms look like. It's so much fun. I'm currently in the process of dramatically decorating my room because I just recently moved. I'll definitely post pictures when it's all done. Also, I can't stay away from the computer in the morning. I wake up DETERMINED to just get ready and go but always end up checking blogger, facebook, twitter, etc until I end up having like 2 seconds to get ready hah. It's a sickness. i can not imagine 1.5 hr commute to work! you go girl..
not to be a creep, but you have pretty skin! What a nice peek inside Kallie's world! Ugh, I used to commute an hour and a half to work too. Blaecch. I should really do some yoga in the morning.. and forbid myself from checking emails/comments as it always makes me super late! 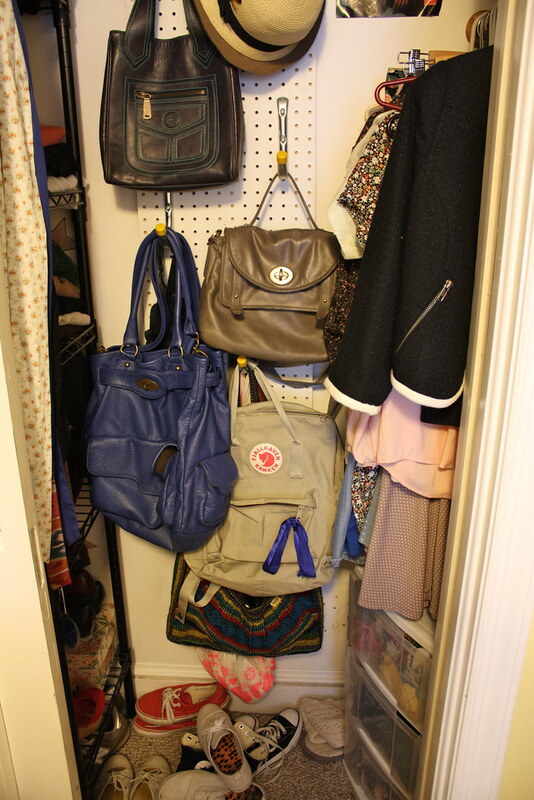 I love how you have your handbags in your closet...so organized! Props to you for making such a long commute every day. I used to lay out my clothes, but I find that I never want to wear what I laid out the next day! Wow, an hour and a half is a really long commute! I like seeing how people organise their wardrobes, the way you store your bags is a really clever idea! This is a fun, casual post. So brave of you to put in your wardrobe. Mine is such a mess! Usually I just read books on my iPod on the way to school, I wish I could sleep in as well! I'm a night showerer as well - I need more time in the mornings! And I also do a quick 20 minute work out most mornings to wake me up. 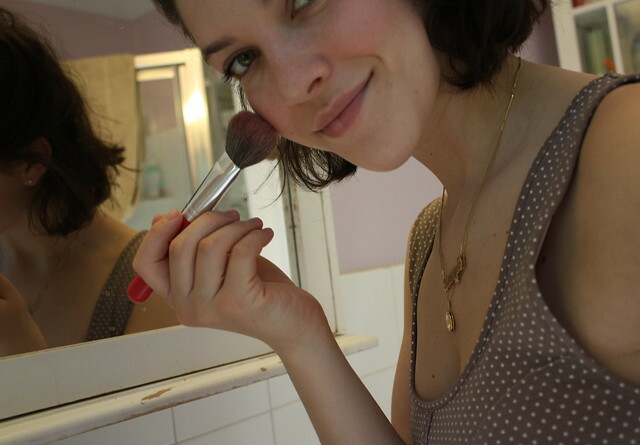 I find people's get ready routines fascinating! Haha. I can't believe your commute is that long! I don't know what I'd do. I guess it's not so bad since you're not driving. If I had to drive 1.5 hours to work I'd die. I thought my commute was bad with an hour on the bus! Aw! I loved this post about your morning routine. I'm not looking forward to having to get up early for work when I graduate next year. I am totally guilty of hitting the snooze and trying to calculate just how little time it can take me to get ready in the morning. I totally need to try doing some of that good mood morning yoga! um OH MY GOSH YOUR COMMUTE IS ABSOLUTELY INSANE. I drive twenty minutes to school. That's long for me! Hahah. Mad respect! And I loved reading your morning routine! I was recently talking about this with my friends, haha. I used to commute 45 minutes from Brooklyn and I thought that was rough. I too take a shower at night and pick my clothes out the night before. It makes the mornings run much more smoothly. Hope your Saturday is going well! I love this place! I like to compare with other cultures, other lifestyles. Loved reading about your morning routine! =) Also, a 1.5 hour commute is so brutal- I don't know how you do it!